On February 22-23rd, amid the august surroundings of the University of Glasgow, Emotive held its first User Workshop. The event brought together a small group of cultural and creative experts for two days of intensive, hands-on prototyping and preliminary evaluation work. Day 1 of the workshop focused on Çatalhöyük. 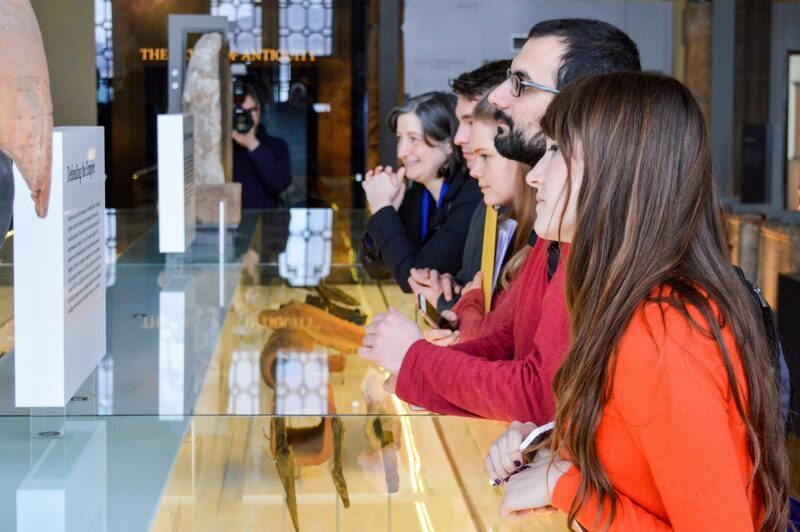 It began with presentations on the history of the Turkish site and its current visitor offerings, plus an overview of the Emotive project itself. After these sessions, the group of approx. 30 split into smaller teams of 5-6 for a hands-on activity, the purpose of which was to a design a new visitor experience for the site. A prototype set of Emotive story design cards was also distributed, to help structure and guide this creative process. By the end of the afternoon, there were impressive results. The teams produced highly varied experiences, ranging from an all-knowing ‘wizard’ who could be engaged to answer questions about the site, to a role-playing adventure with archaeologists and a ghost from Neolithic times, to a treasure hunt and a tour guide-based voting game. Along the way, the Emotive team gained valuable insight into the requirements and mechanics of card play among expert groups and the specific impact that the story design cards had on the experience. Day 1 ended with a short evaluation-oriented debriefing session, followed by a live-streamed Skype lecture and Q&A with the world-renowned game designer Professor Jesse Schell. On Day 2, the group focused on developing experiences for the Antonine Wall exhibition at The Hunterian Museum. As with Day 1, presentations preceded participatory group work, with valuable, insightful lectures by both design and content experts. In the afternoon these gave way to a semi-open-ended group activity at the Antonine Wall exhibition itself, located just a short walk away at The Hunterian Museum. The activity included “bodystorming” in the museum display area, designing a suitable experience for assigned personas, and a summative “dramatisation” of the experience to the plenary. As with Day 1, there was an impressive richness and variety of experiences designed by the five groups, ranging from dressing up profiles and soap opera scenarios to interactive dating apps. Further feedback on the design tools – design cards, visitor personas and suggested objects – also proved illuminating. The findings from both days will feed into ongoing work developing narratives for the two sites in the coming months. Overall, the first Emotive workshop was an extremely successful event. It brought together 30 cultural heritage experts, of which 20 were experts external to the consortium. All contributed in meaningful ways to the project’s goals. The data gathered will now be analysed in depth as the project continues to develop content and tools to enhance emotional storytelling at museums and heritage sites.